UK smartphone users have been eagerly awaiting to switch to the updated Windows Smartphone platform following the release of Microsoft's Windows 7 mobile O/S on 21st October, which had been accompanied by the announcement of HTC updating the the HD2 handset to HD3, which as the below spec's illustrates implied a quantum leap from the HD2 to the HD3. However buyers need to be warned that ALL of the HDC HD3/HD7 phones being advertised in the UK today as HD3 are in fact a model that is in between HD2's and HD'3. There is clearly an attempt to entice users to buy in the run up to Christmas, the easiest way to tell the difference is that the HD3's are specked to have a 4.5inch screen whereas the HD2 and HD7 have a 4.3inch screen size. As of writing the real HD3 is NOT available in the UK and probably won't make an appearance until well into the New Year. The big difference between the three models is that the HD3 proper has a far higher resolution screen of 1280/800 against the HD2 and HD7 which is stuck at a sub Iphone screen resolution of 480/800. 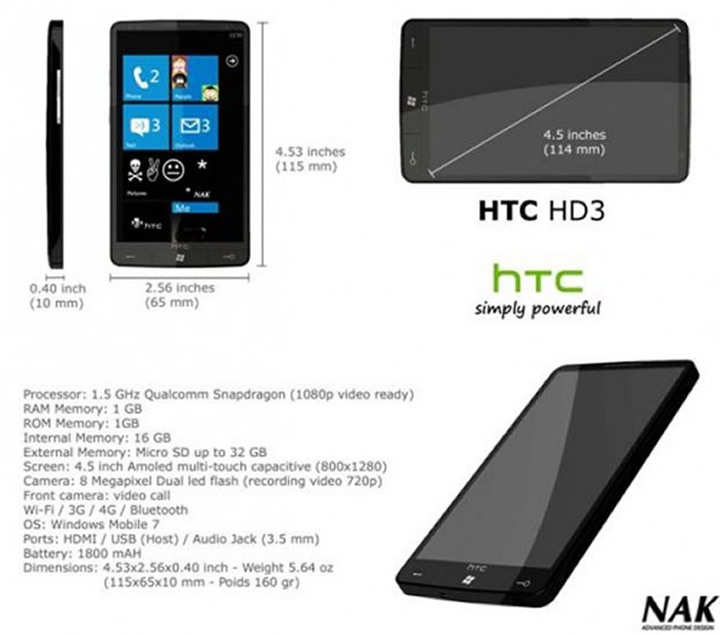 The below table further illustrates the key difference in specifications between the three models which definitely concludes towards potential purchasers waiting for the REAL HTC HD3 to become available rather than being duped into buying a souped up HD2 that is being ms-advertised by many as a HD3. The HD7 represents only a marginal improvement on the HD2, whereas the highly promoted HD3 represents a quantum leap. The UK O2 mobile operator's site at this time is not offering the full HD7 specifications i.e. screen resolution, processor, ram/rom, battery etc. Which means many may incorrectly conclude that the HD7 has the same specs as the HD3 when it clearly does not. Similarly many mobile sellers are advertising the HD7 as the HD3 when the specifications do not match.